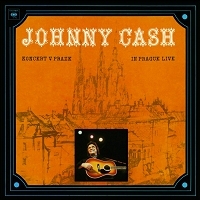 For the first time ever, Johnny Cash's legendary live album "Koncert v Praze" will be released on CD. The show was taped in Prague, former Czechoslovakia in 1978 and later released on vinyl in 1983. The performance was a historical and defining moment for the European music scene. Check out background information and exclusive memories of the performers! First of all we should remember that it was a really big deal for western artists to perform in the Soviet bloc back in the day. In 1974 George Hamilton IV made history and became the first US artist to perform behind the Iron Curtain when he played in Prague and in Moscow. These shows earned him the title "International Ambassador of Country Music". 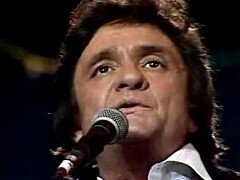 Equally as important was that he opened the door for other artists, which also enabled Johnny Cash to come over and play in Prague in 1978. Johnny Cash played four shows at the Sports Hall in Prague, former Czechoslovakia in April 1978. June Carter Cash, Anita Carter, Rosanne Cash and Jan Howard all accompanied him on this trip. According to a historic source, Johnny Cash "did more for U.S.-Czech relations in four concerts than [the U.S. Ambassador at the time] could have accomplished in four years." The live album "Koncert v Praze/In Prague-Live" was released in Europe in 1983 and included bilingual Czech-English liner notes. The record wasn't released in North America until 2002 when it was featured in the 63-CD box set "Johnny Cash: The Complete Columbia Album Collection". It's also the final Johnny Cash album to feature Marshall Grant on bass. A few years ago CountryZone interviewed Rosanne Cash and Jan Howard, who were both a part of this tour, and asked them about their memories of this particular trip. Rosanne recalled that she and other performers weren't sure how people in then Czechoslovakia would welcome them and how astonished she eventually was about their response. "I remember very clearly that we had a bus and we stopped at the town square. My father got out and a thousand people just came and rushed up to him to speak to him. It was just a beautiful moment. They loved him, he loved them back," remembers Rosanne. Jan Howard, on the other hand, recalls the lack of freedom and how tough the regime was: "We came through East Berlin and it was not a good time to be there. It was beautiful, but we couldn't go anywhere without guards and all that stuff. I wish we had had an opportunity and a privillege to travel more in there, but we couldn't at that time. I'm glad it's changed." The legendary live album comes out under an original Czech title "Koncert v Praze" (In Prague-Live) on February 5, 2016.